The appeal of Morrowind for a first-time player today is surely that of getting lost. 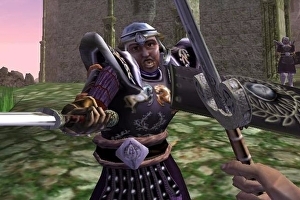 The game’s once-breathtaking Gamebryo engine may creak with age, and its brittle, RNG-heavy combat may seem relentlessly archaic, but Morrowind’s relative shortage of navigational aids now feels positively radical. Most currently prospering open world RPGs are littered with waypoints and breadcrumb trails, their treasures and secrets tagged for consumption once you’ve accosted the relevant NPC. Approach somebody about a quest in Morrowind, by contrast, and you’ll be handed a list of directions. There are no omni-visible floating diamond icons, no distance-to-arrival readouts – just a series of landmarks and turnings, scribbled down in your increasingly unwieldy journal. Returned to after a decade’s worth of Assassin’s Creed and Far Cry, it’s all rather terrifying, like sobering up in the middle of a busy motorway. The directions aren’t even universally reliable, or exact. Sometimes you have little to go on beyond the name of a region – there’s a mission to locate somebody near Red Mountain that plays out like a Hunter Thompson rewrite of Christ roaming the wilderness, in which you fend off while combing the dunes for your quarry. Due to be remastered this summer as an expansion for The Elder Scrolls Online, Morrowind isn’t a particularly large or impenetrable world – its roads well-signposted, its towns clustered close together – but having to actually look for the place you’re looking for is invigorating, a show of faith in both the player’s patience and the environment’s intelligibility. And my, what an environment to get lost in – with its balding purple hills that reveal themselves to be enormous toadstools on closer inspection, its Dunmer citadels that evoke the stepped sandstone mounds of Angkor Wat.